My favorite summer breakfast! Cool, hearty, and nourishing – with this easy formula, you can make your own muesli exactly how you like it. This post was sponsored by Silk. In 2016, I partnered with Silk to post monthly ideas and recipes celebrating an Earth-friendly, plant-based diet and life. This recipe was a part of that series. Like many of us, I grew up on boxed cereal for breakfast. Pour out the the dry deliciousness, douse in milk of choice, and go! But as I’ve moved toward a healthier, whole-foods-based diet, I’ve turned away from most processed foods – and cereal in a box is a casualty. But I still missed the convenience. Not anymore, though. Helloooo, muesli! 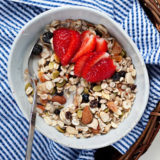 Muesli is basically an un-toasted granola, made with raw rolled oats and other rolled grains (if you wish) along with nuts, seeds, and dried fruits. It’s not doused in any sweeteners or oils to aid in the baking process – because there is no baking process! So it tends to be a lighter, healthier option than granola. That’s not to say I don’t love my granola! But in the summer months especially, muesli is my go-to. It’s cool, it’s quick, and it’s hearty. 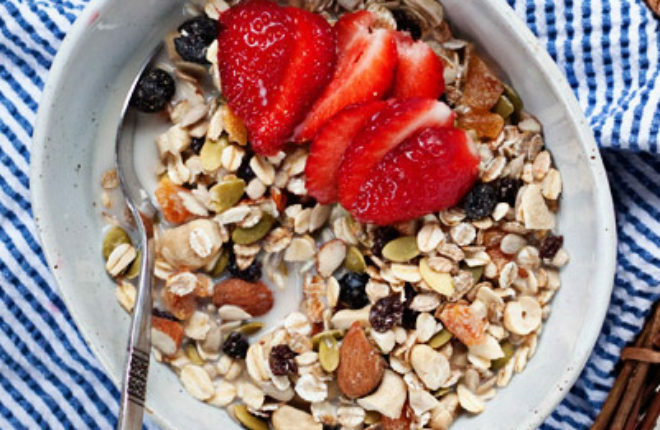 You can buy muesli at the store – I find it in the bulk section or among the boxed cereals. But why would you? 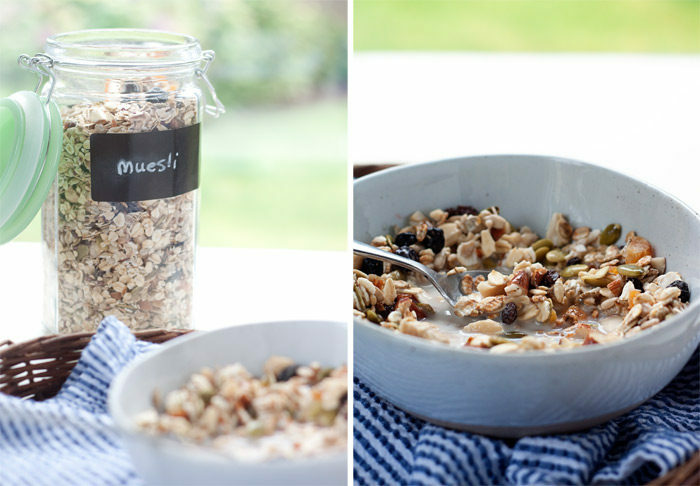 It is SO easy to make muesli at home! Okay, I admit to buying it now and then when life gets crazy. But I really prefer making muesli because I can customize it exactly how I like it. My version has lots of nuts and seeds for added healthy fats and protein. And a lighter hand with the dried fruit to help cut down on sugar. Here’s how to make muesli so you, too, can enjoy your own super-duper easy and healthy plant-based breakfast at home! 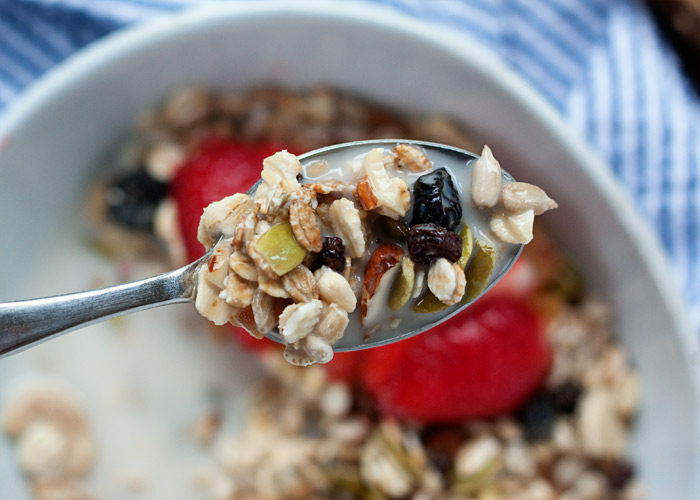 Making muesli is ridiculously easy. 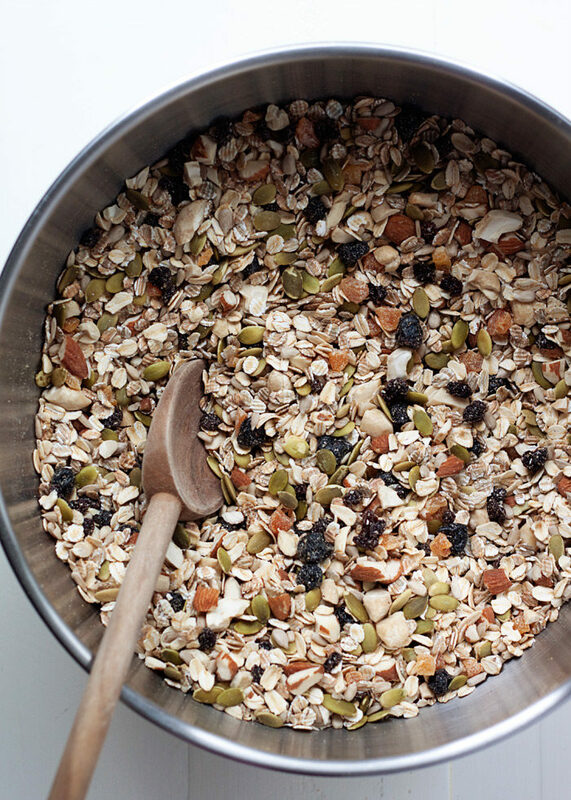 Step 1: Stir together a few ingredients – oats, nuts, seeds, dried fruit. Step 2: Um, well, eat! Then I just stir it all together in a big bowl, store it in an airtight container, and scoop out 1/2 cup or so for each breakfast or snack. This is pretty straightforward. I buy my rolled oats out of the bulk bin at my local grocery store. If you are gluten-free, you’ll want to look for certified gluten-free oats. Or just another 2 parts rolled oats! If you’re gluten-free, you’ll likely want to stick with quinoa flakes – or simply add more gluten-free rolled oats. This is where it gets good! Throw in one or more of the following. Chop up the bigger stuff first! 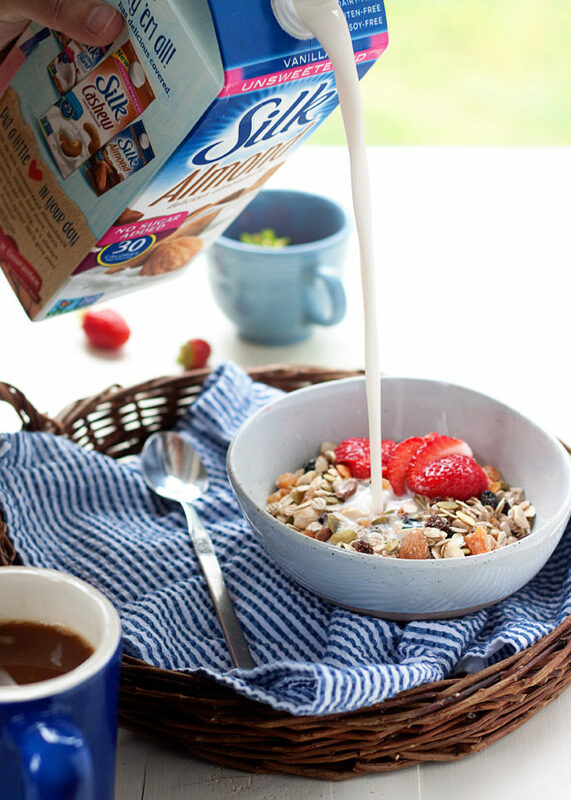 Mix and match however you want – make your muesli your own! To serve, scoop about 1/2 cup into a bowl, pour on some milk (I prefer unsweetened vanilla almond milk), and enjoy it right away or let it soak for 30 minutes or so to soften. I love to go crazy with fresh fruit on top so that I can feel virtuous about my breakfast (well, and also because it’s tasty). Some folks like to mix it with yogurt. Others like to go the overnight oats route and let it soak all night – then just grab it out of the fridge in the morning and dig in! (There might also be health benefits to the overnight method, as described here). A squeeze of lemon, some grated fresh apple, or perhaps a drizzle of pure maple syrup can also be nice (the lemon and apple are actually both pretty traditional in muesli). 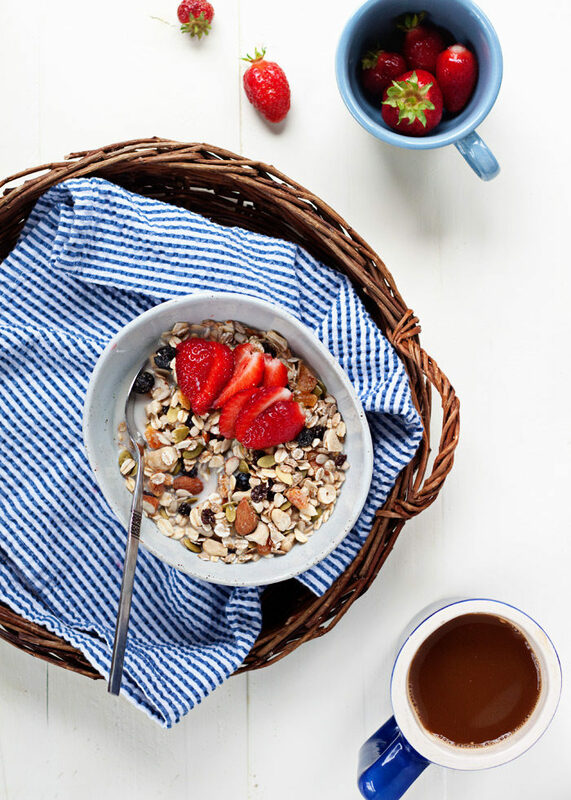 However you like it, there’s no question that homemade muesli an ideal breakfast or snack food for summer. Cool, refreshing, nourishing – and no cereal boxes in sight! Hit “play” to see a fun video that shows you just how easy it is to make your own big ol’ batch of muesli, or go ahead and scroll down for the printable recipe. Add all ingredients to a large bowl and stir to combine. Store at room temperature a large airtight container. Keeps for weeks or even months! To serve, scoop out 1/2 cup and add to a bowl. Add yogurt or milk of choice and fresh fruit if desired. Eat right away, or let soak for about 30 minutes to soften. Or, if you prefer, you can soak it overnight in the refrigerator. This is a sponsored conversation written by me on behalf of Silk. The opinions and text are all mine. Thank you for supporting the companies who support Kitchen Treaty! Find Silk in stores and sign up for Silk’s email newsletter for great coupons and giveaways. This is great — thanks! I used 1/2 cup as my “part” (1 part this, 2 parts that….) and made at least 3x as much muesli as there is in a store-bought bag at about 1/2 the cost of the ready-to-eat. And with WAY more seeds, nuts and dried fruit than the store-bought version as well. I think it took me all of 10 minutes, at most. Awesome! Thank you for this recipe! Muesli is my go-to meal before a bike ride. I like that this recipe has a bunch of slow release carbs and fibre. Can you give an estimate on how much milk (or yogurt) to use to soften? I plan to soak overnight and am looking for an amount to start with. SIngle serving. Thank you! As a member of Weight Watchers (married to a wife who lost 110 lbs – I’ve lost 30 of 90 lbs – our doctors mandated weight loss, so we are serious), I have to count lots of points for dried fruit, but fresh fruit is free on the diet, so I’m going to try your recipe with fresh fruit, nuts, seeds, oatmeal, and some other grain. I’ll put it in yogurt overnight and add fresh fruit in the morning. I’ve actually tried a vegetarian diet – although my wife likes her meat. But who cares? We’re happy! That’s a great idea. I’ve just started Weight Watchers myself, and those points sure can add up! I tried what I suggested with a twist: I got the ingredients I needed from a grocery store – all organic of course – including steel cut oatmeal, raw almonds, raw pecans, flax seed (which happened to be roasted – kind of reminds me of sesame seed), and nonfat Greek yogurt (a little too thick – will try thinner yogurt next time). I measure out my ingredients and put them in a bowl the night before along with yogurt (so I can count points), cover with a plate, refrigerate overnight, add fresh fruit in the morning and enjoy! I can customize breakfast for anyone who wants to join me. My wife who lost 110 lbs. on Weight Watchers prefers a smaller portion and doesn’t care for flax seed. We can add cut up apple, blueberries, grapes, or whatever in the morning. If the mixture is too thick, a little milk will help. There is no added sugar in this. I love it! As the weather gets cold, I’ll just make hot steel cut oatmeal with all the ingredients and enjoy first thing in the morning! My doctor wants me to get away from any kind of sweetener – the sweetness of fruit is fine – fruits have so many good things and they are free in Weight Watchers! It is really frustrating that I cannot find any ready to eat cereal in the grocery without added sugar. No wonder we’re in trouble! 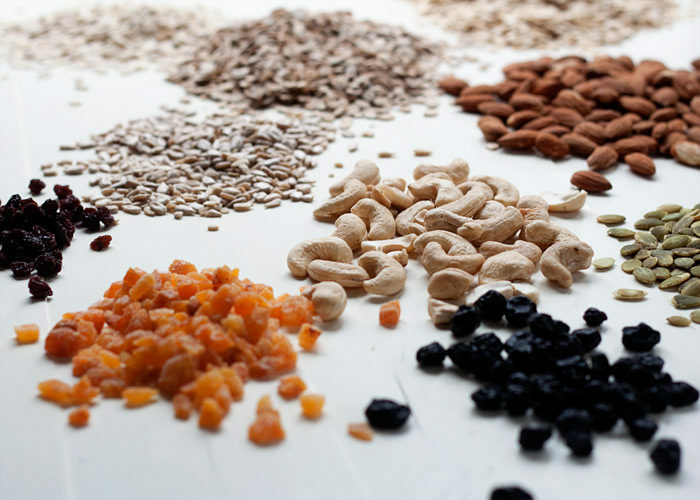 Do you suggest toasting all ingredients – oats, flaxseeds, nuts – before mixing and storing them? I don’t, though I’m sure that would add a lovely element of flavor! thank you! Is it possible to use the same mixture to make healthy snack bars and how? « Previous PostOur Kitchen Renovation: We’re Finally Starting!